When there is one parent and the offspring is a genetic clone, if the parent happens to have a mutation it gets passed on to the offspring. Some examples are fish and sea urchins. Binary Fission is when a single cell splits into two identical copies. Budding is when multicellular organisms go through repeated mitosis to form an identical organism. Fragmentation is when a part breaks off and it grows a back into a clone of the parent. Vegetative Reproduction are special cells that form new plants that are identical to the parent. Spore Formation is when single cells can grow into a whole new organism. Some Advantages to Asexual Reproduction are that it doesn’t take a lot of energy to find a mate, a large amount of offsprings can form quickly. Disadvantage to Asexual Reproductions are that some conditions such as extreme temperatures can take out entire colonies, offsprings are genetic clones and if the parent has a negative mutation that will be passed down to all the offsprings. When a male gamete fertilizes a female gamete and the offspring is a mix of the two. 23 chromosomes get passed down from its mother and 23 from its father. Internal Fertilization is when a female gamete meets a male gamete inside the body, some advantages to this are offsprings are genetically different from there parents and if their parent happens to have a mutation the offspring could survive or not get it. But some disadvantages are that it is generally more effort to find a mate and fewer offsprings ate produced. External Fertilization mainly happens in water when a sperm is released and an egg is released and they find each other. Some advantages to this are very little energy is required to find a mate and offsprings are genetically different from there parents and if their parent happens to have a mutation the offspring can survive. But some disadvantages are that embryos, gametes and offspring are unprotected and are often preyed upon. Mitosis separates one cell into two. It goes through four stages which I call PMAT (Prophase, Metaphase, Anaphase and Telophase) and it only does one round of it. Interphase: This is the longest stage and its when everything pretty much doubles. Prophase: The nucleus disappears and the centrioles and spindle fibers form and attach to the chromosomes. Metaphase: Spindle fibers pull the chromosomes and they line up in the middle of the cell. Anaphase: The centromeres break apart the daughter chromatids and pull them outward to opposite ends of the cell. Telophase: 2 nuclear membranes form, 2 nucleolus form and spindle fibers disappear. Cytokinesis: The cell separates and is now two and restarts back in interphase. Prophase I: Homologous chromosomes pair up and non-sister chromatids exchange genetic material. This is called crossover. Metaphase I: Homologous chromosomes pair up at the equator. Anaphase I: Homologous chromosomes separate and are pulled to opposite poles by the spindle fibers. Telophase I: One chromosome from each homologous pair is at each pole of the cell. 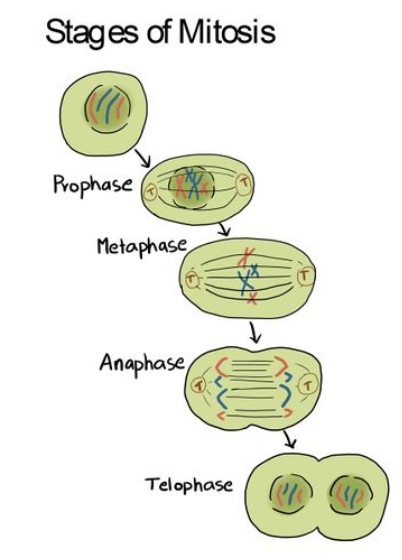 Prophase II: There is one chromosome of the homologous pair in each cell. 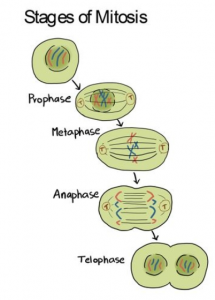 Metaphase II: The X-shape chromosomes form a single line across the middle of the cell. Anaphase II: Sister chromatids move to opposite poles of the cell. Once separated each sister chromatid is considered to be a chromosome. Telophase II: Spindle fibers begin to disappear and a nuclear membrane forms around each set of chromosomes. Internal Fertilization is when the sperm cells go into the female’s body and meet an egg cell. The sperm penetrates the egg and the fetus starts to develop. External Fertilization: Is when a sperm is released (generally in water) and an egg is released. They meet and the sperm surrounds the egg so that no other sperms can get to the egg. Pollination: The transfer of pollen to a plant for fertilization. It is transferred through humans, bees, moths, flies, hummingbirds, wind, ect. Embryotic Development: Its when the embryo is formed and develops. In humans, embryonic development happens in the first two months after fertilization. After fertilization the zygote begins the process of mitosis. Embryotic Development has four stages: Cleavage, patterning, differentiation, and growth. This entry was posted in Science 9 and tagged Rob16cells. Bookmark the permalink.